My second granddaughter arrived a few days ago! 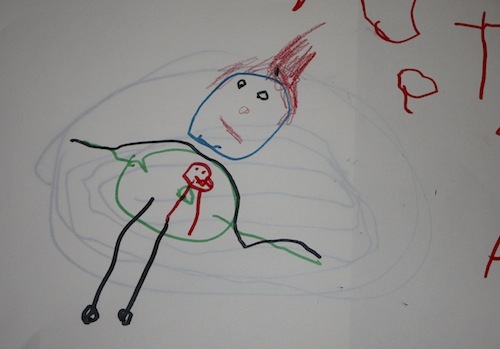 Her proud big sister made this beautiful drawing after seeing her for the first time. The little one was a bit too early, but she's doing great. Mom and dad are fine too. Grandma and grandpa think that she's as cute as her big sister. And now to find the time to put those last stitches to the baby quilt! Huge congratulations to all of you, she's gorgeous and I love her sister's wonderful drawing. 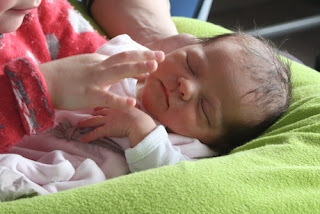 Congratulations Françoise with your beautiful new Grand-daughter!! Love the drawing by her sister! She is beautiful - so delicate! Have fun, Grandma! She's so beautiful! Soak in these precious moments while they last. She is such a delicate, sweet little being. Lucky grandmother! Holding these little, bitty babies is heaven. Félicitations Françoise! 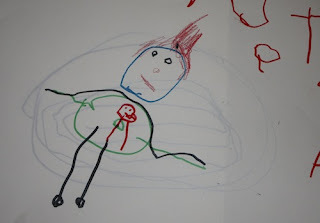 Your granddaughter is beautiful and her sister's drawing is wonderful. A true artist! Congratulations Francoise! What a beautiful baby. This will double your love and pleasure as a grandma! Enjoy, enjoy!! So precious!! Congratulations to all of you on the arrival. Enjoy being a new grandma! Congratulations! She's beautiful Françoise and that drawing is just great. How wonderful - congratulations on your new, lovely grand-daughter! She is precious! Love the portrait! Don't know how that post slipped by me. Congratulations!She looks so cute. Congratulations to the new parents, Sister and Grandparents! She is so adorable.